“They that wait upon the LORD shall renew their strength; they shall mount up with wings as eagles” Isaiah 40: 31 (KJV). One day, several years later, I knew the Lord wanted me to write a book based on my experiences in the Cancer Valley. As I prayed about the possibility, a working title sprang to mind, based on that Scripture verse from Isaiah: Rise and Soar with Over the Cancer Valley as a sub-title. A publisher would likely change it, but for that time the title covered my dream for this book. I prayed that many would one day read it and learn to rise like an eagle above the rigors of cancer. My prayers was that as they spent time reading the book and the corresponding Scriptures, their strength would be renewed. Throughout the next months, I continued to pray for Rise and Soar. I prayed for ideas for the meditations and started to draft them out as I thought of them. Some of the original ideas even got published in devotional markets, using the publications’ own formats. As I prayed about the upcoming book, I grew more and more excited. What would the Lord do to complete the dream? Somehow I knew I would hear from the Lord when the time was right. I had no idea how I would find a publisher, especially as I live in South Africa, and there were no publishers here that would be interested in that sort of book. However, when I sensed the time had come, I started work in earnest. I began to write the meditations and submit them to my critique group. Thanks to a series of amazing miracles, I ended up at the Florida Christian Writers Conference in America, where editor Vicki Crumpton of Revell Publishers liked my book, Rise and Soar above the Valley of Cancer. Revell purchased the book, and over the next two years Vicki helped me format and polish the book. 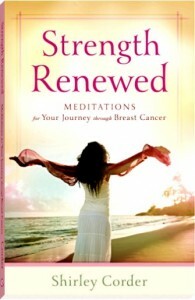 Rise and Soar gained a beautiful cover and went on to become Strength Renewed, Meditations for Your Journey through Breast Cancer. It was published in 2012 and was available in bookstores across the world. Just last week, I had a Skype call from a nephew living in London, England. He wanted to tell me of a friend who had been diagnosed with breast cancer. “I went straight to Amazon.uk” he said, “and I bought your book. It arrived the next day!” How good to know I was able to encourage this young lady half way across the world to me! You can still get your copy (in print or e-book) from Amazon.com or any of the other online bookstores. Have you read this book? If so, I would love you to write a short review on Amazon and anywhere else of your choosing. Your book will inspire others to courage. I have cancer in my family, so this issue is very close to my heart. Thank you for letting me know, Damyanti.. Every blessing as you come alongside your family members. Thank you, Damyanti. Yep, I’m 20 years down the road. The Lord is good! I think it is amazing that you decided to pen down your meditations and leave something for the others to read and find strength from in the form of a book. I cannot think of many who can do that. I truly admire your positivity and grit that saw you through your illness and made you share your wisdom so beautifully. Will definitely check out the book in Amazon today! More power to you, dear Shirley! Thank you Esha. It was something I knew I had to do. Thank you Esha! Your words are very encouraging. I hope you enjoy the book. I’m a little surprised that there are no Christian book publishers in South Africa. We have several in the United States, as you are well aware, and I’m happy that one picked your book. But more than that, it is inspiring enough that you had a vision and proceeded without knowing if your vision would even find a home. Perhaps your journey of writing and getting the book published could be part of a memoir on day. That would really inspire, I think. Haven’t read it yet but honestly, it is something I am looking forward to reading. Roshan, what haven’t you read yet? I’m always inspired by true life stories. It’s meant to be when we get messages from the other side. Very nice Shirley I’m sure many will benefit from your book. Thank yoi, Suzy. Have a great week. Thats an amazing story Shirley.It takes a lot of strength to share your own story.Its not easy.Agree with the quote.We need to have faith . Thank you, Amrita. It was a scary but very exciting adventure! What’s also thrilling is that it’s still selling today, nearly 6 years later!